Forget the stereotype of the cruise or the conservatory. For many babyboomers reaching their sixties means joblessness and ill health, according to TUC research published today. Around one in eight (12%) men and women are forced to stop working before state pension age due to ill-health or disability, our report Postponing the pension: are we all working longer shows. This isn’t the story often told about older people which tends to be one of a “cosseted”, free-spending generation rattling around unreasonably large homes. It is also not a tale that suits those who proclaim a simplistic mantra of “work longer, save more” or even a State Pension age of 80-plus. What our figures show is that nearly half a million (436,000) workers who are within five years of state pension age have had to leave the workplace for medical reasons. This is with current State Pension age of 65 for men and a female SPA that is currently 63 and rising to match that of men. The analysis also reveals a stark North-South divide. 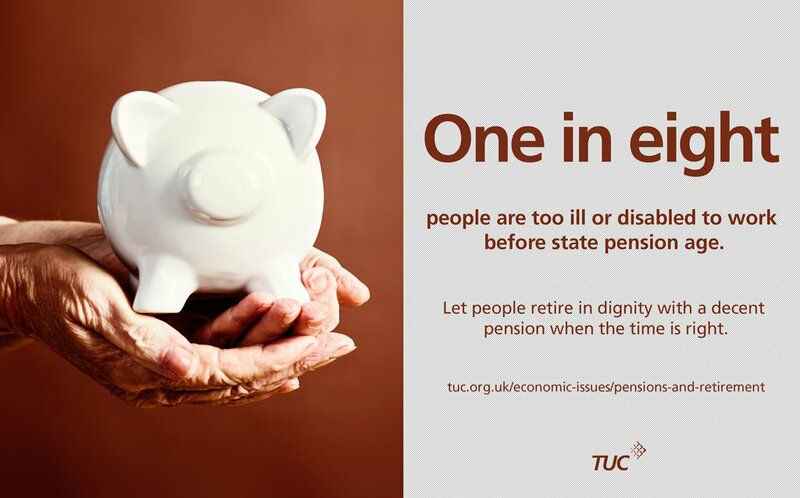 In the South West of England, sickness and disability is cited by just 1 in 13 of those who have left work in the run-up to state pension age, followed by 1 in 11 in the South East and in the East of England. But this rises to 1 in 7 in Yorkshire and the Humber, the North East, the North West, Wales and Scotland and 1 in 4 in Northern Ireland, reflecting wider health inequalities across the regions and nations of the UK. The report also reveals that those who have worked in the lowest paid jobs – including cleaners, carers, those working in the leisure industry and those doing heavy manual jobs – are twice as likely to stop working before retirement age due to sickness and disability than managers or professionals. This is a headache for policymakers. What easier way to set State Pension age – currently the subject of a review led by John Cridland than to draw a line on a chart, and assume that we will all just work longer to get there? But our evidence shows that even with current retirement ages (and increases to 66 and 67 are already in the pipeline), hundreds of thousands of older people are dropping out of work due to illness. Even claiming that we are living longer is not the straightforward story that is claimed with the latest government stats actually revising down life expectancy. Undeniably, the face of the labour market is changing, with older workers (which we define as those aged over 50) playing an increasingly important role in the workplace. But around half of all workers still leave the workforce before State Pension age, often many several years before. This suggests that public policy needs to address twin challenges. Firstly, enabling those older workers who want to work to do so. And secondly, ensuring that those who cannot work are provided for. Seeking to use an increased State Pension age as a crude tool to encourage longer working is likely both to be ineffective and risk increasing hardship among older people. Over the last 15 years the ranks of older workers – those aged over 50 – has increased by nearly three million or 44 per cent to 9.6 million. There remains an enormous drop in participation in the labour market from well before State Pension age. Barely half of 60-64 year olds are economically active. There are nearly half a million people within five years of State Pension age who are too ill or disabled to work, this is one in eight. Up to a third of older people from manual occupations who are economically inactive ahead of retirement cite sickness or disability as the reason. This is twice the rate of those in some white collar categories. If policymakers want to ensure that people stay in the labour market for longer, this will require policy interventions to overcome the barriers and discrimination that many face. Simply pushing up State Pension age risks leaving older people in hardship while many will continue to draw on state resource through the working age benefits system. Strengthening opportunities for flexible working from day one of employment to accommodate the needs and choices of the worker. Developing mid-life career reviews so that they become effective vehicles for ensuring older workers receive the support to continue their careers. A right to retrain for older workers. However, it is clear that further major initiatives are also needed in the arena of public health and in reducing inequality more generally if we are to reduce vast disparities in health and therefore the ability of people to work into their later years. I am multi tasking as was watching too posh to parent on channel 4 whilst successfully believe it or not searching for this article which was brought to my notice on BBC teletext. Also noted the bbc teletext actually updated this article. WOW as they say! Cut to the chase – I should probably resurrect my Twitter account. May I also ask a question – my Micky Mouse interpretation of current pension policy and funding is a straightforward for want of a better word – transfer from the state to corporate. Great article. No mention of the mass clear-out 10 years or so ago – of women aged 50 or over who were suddenly made redundant just as the “ageism” law was being introduced-many from senior positions in professional careers (who then found themselves unable to get any interviews, nor work unless it was voluntary or low paid, or were forced by Job Centres into trying to make a “business” of a hobby such as cardmaking ). And then, 0 to 3 years before expected 60 State Pension age, found out that Govts had taken away up to 6 years’ State Pension without writing to tell the women for at least 14 to 17 years after the non-communicated 1995 Act. Savings have been used up, properties, jewellery and lifelong possessions sold in order to eat and pay bills. No wonder so many are becoming ill. There will be more suicides too. I am 60, and unaware/not notified of pension changes for women of my age. I suffer from rheumatoid arthritis. Last year I came home from work, fell out of the car and collapsed. I live alone so there was no assistance. When I came round I dragged my self in the house, when I felt a little better contacted my GP who sent a trainee. As a result I suffered vertigo, severe weight los of 3.5 stones, had to get two carers in one for night and one for day and in the end my career took me to the GP 4 months later as I could barely walk, so the GP could see the state I was in. I am now 8 months unpaid sick back at work wondering how long I have left to live. I have no leisure/quality of free time I’m too exhausted. Please can someone make sense of this mess and sort it out.